Each week we see gorgeous projects featuring My Favorite Things product, and we're always so thrilled to see what our customers and followers are creating. Today, we'd like to shine the spotlight on some fantastic projects that have caught our attention in another edition of You've Been Spotted. Grab something tasty to drink and get ready to ooooooh and aaaaah over some of the lovely cards we've noticed recently. If you see your card featured, feel free to post this image on your blog and link to this post to show the world that you were spotted by My Favorite Things! 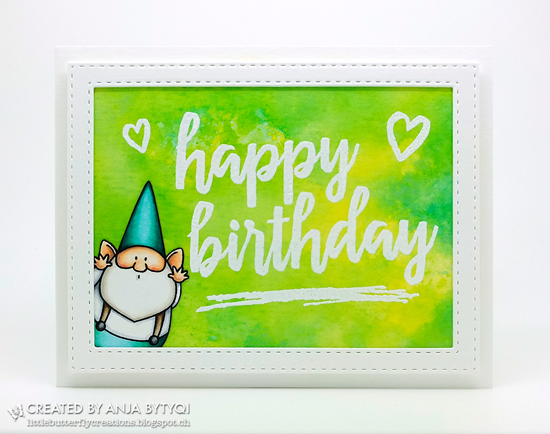 Design Team member Kay Miller spotted Anja's card and had this to say about it, "Love the beautiful background and that little gnome peeking out of the stitched frame!" Anja created this card for a birthday card challenge. She used the Written in Watercolor, Abstract Art, and You Gnome Me stamp sets. Sharna posted this photo in our My Favorite Things Facebook group (you can join us HERE). 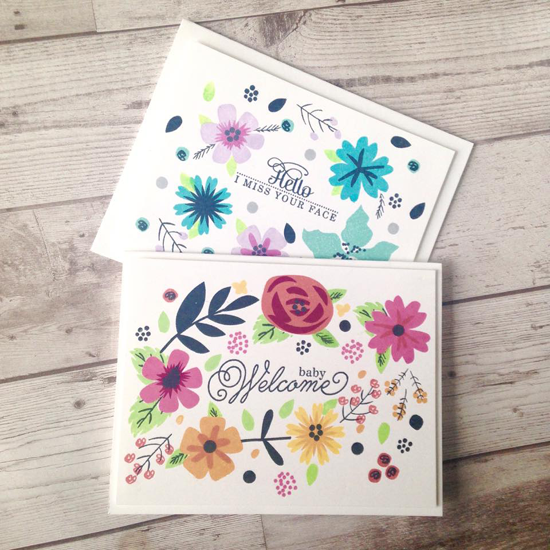 Her use of the Modern Blooms stamp set simply took my breath away! Just. Gorgeous. 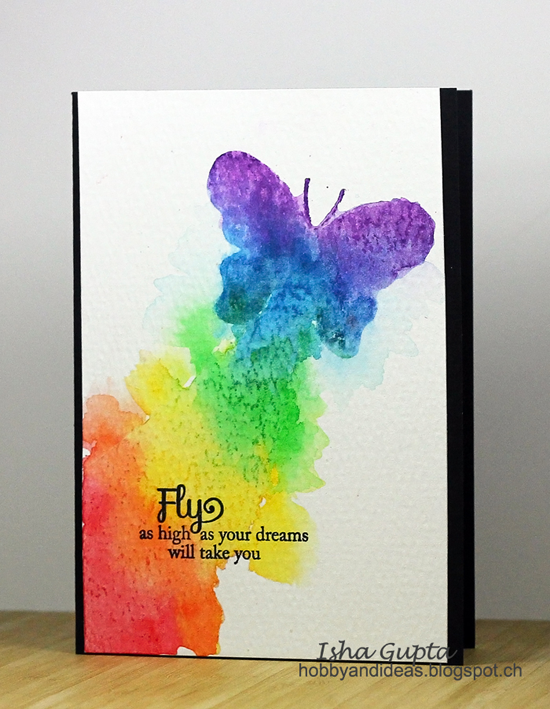 Isha created this card using the Blissful Butterflies stamp set as her homework for the MFT Summer School session about Movement. Design Team member Teri Anderson says, "The way she used color to create movement is dang cool." I have to agree with you on that one, Teri. Sandy's card created a bit of a sensation with the My Favorite Things gang! Both Design Team Member Stephanie Klauck and Graphics Guru Laina Lamb spotted this coloring masterpiece on Sandy's Instagram feed. 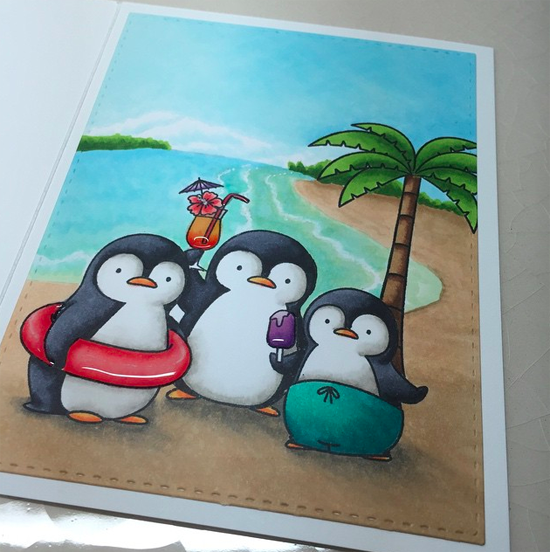 Sandy admits that this is her very first MFT stamp set (Penguins in Paradise), and she enjoyed using it to participate in Kathy Racoosin's 30 Day Color Challenge. Sure hope to see more of Sandy's impressive coloring skills with MFT Stamps! Design Team member Donna Mikasa spotted EunJi's beautiful card created for Sketch 234. 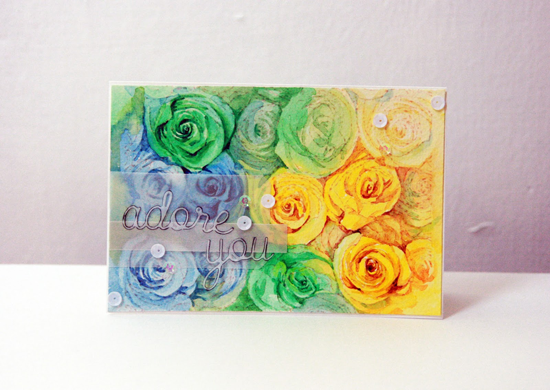 Donna says, "Eun Ji loves to watercolor, and she made the Roses All Over background stamp come to life." Thanks for using MFT, ladies! You've left us inspired, and that's what it's all about! See you tomorrow for the next Sketch Challenge, and look for a new MFT Color Challenge this Thursday, July 9th! Which design is your favorite? Be sure to leave these ladies some love. And who knows? You might be spotted sometime soon! Oh goodness thanks so much for the spotting and kind words. I really enjoy my MFT sets and dies. Well of course Sandy Boone deserves to be spotted! This card is seriously just the tip of her creative iceberg. Way to go Sandy and way to go to the team who spotted her to give her some much deserved recognition. - Audrey posting as 'anonymous' because well, just because. Thank you so much for spotting my card and the lovely comment, Kay! Makes me very happy and proud! And thanks to MFT for your awesome and inspiring products! I can understand why you spotted these cards. Each one is so special! Thank you so much for including my card! I am truly flattered to have my work featured alongside other such incredibly talented ladies. And these stamps are just fun to colour!